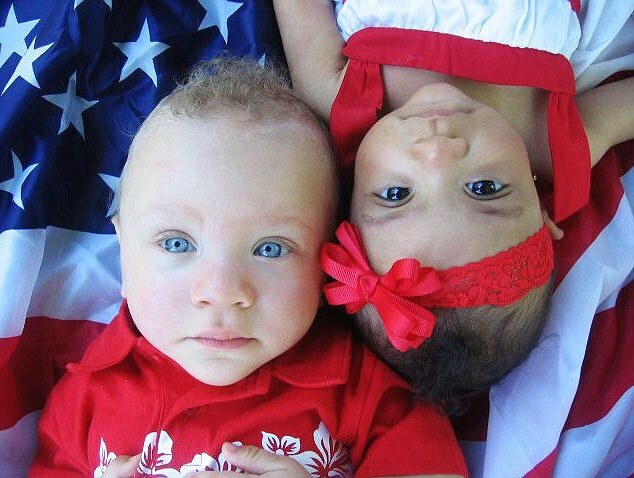 BIRACIAL TWINS, ONE "LIGHT SKINNED" AND ONE "DARK SKINNED"
Some babies take after their mothers, others after their fathers and some it can be difficult to tell. But friends and family are having no such trouble with 17-month-old twins Triniti and Ghabriael Cunningham from Akron, Ohio. That’s because, with odds of a million to one, light-skinned Ghabriael takes after his mother, Khristi, who is white, and dark-skinned Triniti takes after her father, Charles, who is black.